Looking for a place to stay in Ao Nang? There are a few budget options near Ao Nang beach, and some 5-10 minutes from downtown Ao Nang. How is the standard? Well, you normally get what you pay for. If you're staying at a hotel, you'll have access to typical hotel facilities. Cleanliness varies, so read reviews beforehand if you're picky about where you're staying. Popeye has received good reviews from backpackers because of the cleanliness and good value. You get air-con, TV, safe and hot water for 500B! Such good prices don't come often. Didn't stay here but Laughing Gecko is a family-run bungalow place, and it's known for friendly atmosphere and a good restaurant. 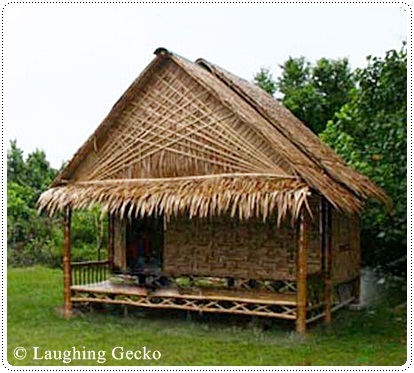 Their huts are very simple and are made from all natural thatched bamboo. My simple fan room on the 1st floor was spacious, with attached bathroom and hot water. And one of the hardest beds I've slept on. I think the rooms in the upper floors are much nicer. If I were you, I would avoid a room on the 1st floor. There were ants crawling under the crack of the door, and onto my bed. I don't know if it was just bad luck or not...! But either way, its excellent location make up for this. I could just walk right out, and the beach would be three minutes away! PK Mansion also offers internet access, and they have a small restaurant serving Western breakfast and lunch (right by the entrance). I ate one breakfast here, and it was OK. But I preferred the better food at the food stalls, just across the road. Note: The hotel was packed when I arrived in Jan 2008, so I had to crash in an expensive room (1400 B). Downstairs you have (expensive) internet access, and the staff will gladly arrange tours. I arranged a minivan to Khao Lak through J Hotel, which was effortless. If I would to stay in Ao Nang again, it would definitely be here! Not found a room you like? Here are some guesthouses/budget hotels in Ao Nang, rated quite good at Tripadvisor. Heading for Railay beaches? Check out our travel tale!